Hi, I'm wondering a couple things. I have downloaded an item from H5P.org and uploaded it to my h5p.com organization site. 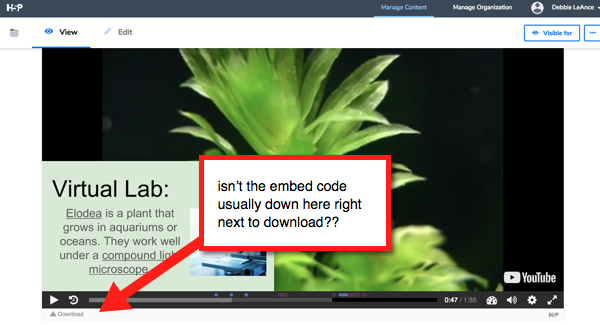 I'm wondering though, am I still able to grab an embed code like before to host on my LMS? I'm a little confused. Or would I host the link on my LMS to the .com page where my content is? I anticipate more questions will be coming too. Is this the appropriate forum to share my questions to? Thanks again!!! I love H5P!!!! Afaik as I know using an embed code from .com is possible. The .com site has all the features that you see in the .org site and more. On that note if your contents are hosted in .com you will have more flexibility on how you'd like to use them. You can now use everything that H5P contents has to offer like retrieving scores which is not possible by using the embed feature. Hi, Thanks for the reply. I probably am missing some very obvious thing, but I still don't see where the embed option is. I've attached a screenshot if you can help redirect me to the link. Thanks! While H5P.com is in beta just send any questions regarding it to me. H5P.com embeds via LTI - I think you were trying to embed on a site that doesn't support LTI yet, and that isn't possible, but will be very soon.